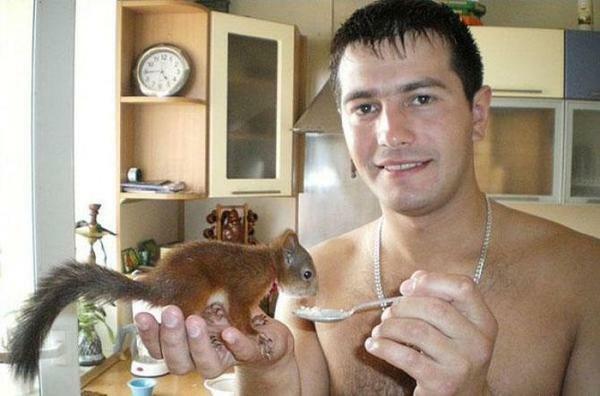 Pyotr Pankratau was a soldier in the Belarussian army when he rescued a weak baby squirrel on the verge of death. 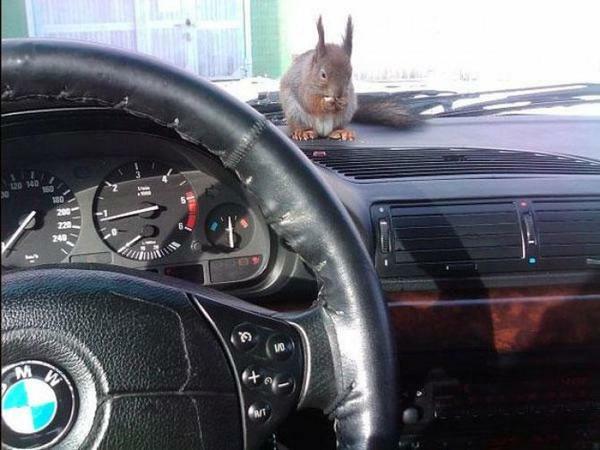 Two years later, Pankratau is now a taxi-driver, but the squirrel never leaves his side. 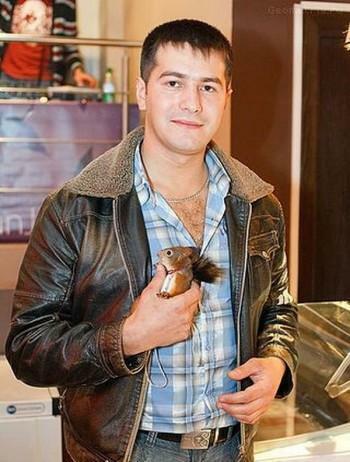 Soldiers in Belarus found the feeble baby squirrel and brought him to Pankratau, who was their warrant officer. Pankratau took in the tiny squirrel, feeding it like a baby every four hours until it returned to health. "He was lying unconscious under the tree. There were worms in his mouth and right eye, I took them out. However, two weeks later everything got back to normal. I fed him with baby food and milk through a syringe ... Then his teeth came out and he started eating himself. Half a year later I vaccinated and registered him," Pankratau told Euro Radio. 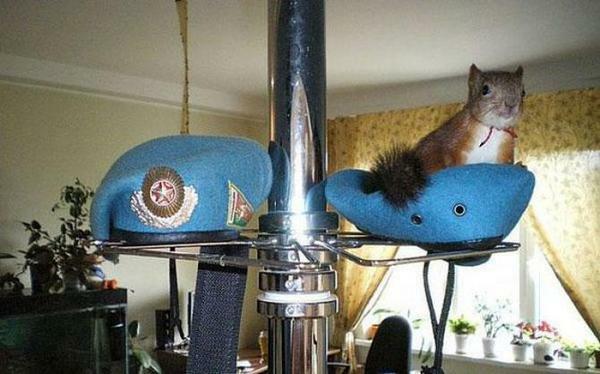 The squirrel, dubbed Minsk, stayed with Pankratau throughout his military service. Now, two years since the rescue, the pair continues to be inseparable. Pankratau has left the army and works as a cab driver. Minsk is never too far from him, taking up the role of assistant cab driver. Minsk is very well trained and keeps to his designated areas in the cab, lying in his bed on the dashboard or peeking at Pankratau through the wheel. 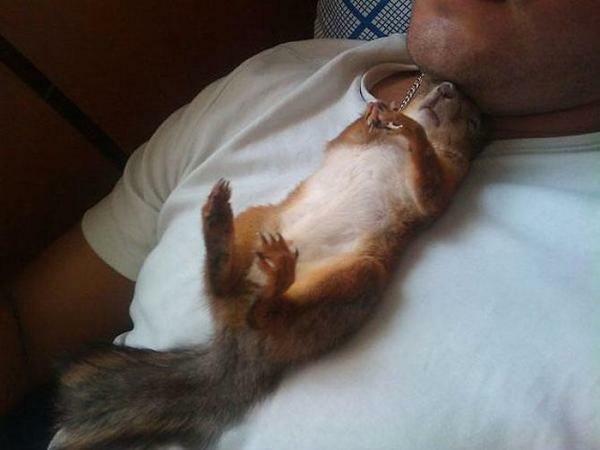 Responses to "The Story Of A Soldier And The Squirrel Who Never Leaves His Side"
Sooo cute! I love it! What a sweet guy to save him and take care of him! That's awesome! This world is blessed to have people like this who care about all of God's creatures. sleeping by your side, and go everywhere with you ? thank goodness that there are people that will help animals instead of hurting them. that story was so lovely and i hope they enjoy each others company for many years to come. I THINK THIS ONE OF THE BEST ANIMAL STORIES I HAVE EVER SEEN.SIMPLY AMAZING. humanity should embrace all kinds of living species in the world care for them and respect them I believe, instead of destroying them or worse, getting profit from that destruction and devastation. The bond of love is very strong..
A amizade dos animais quando bem tratados. Uma bela História ! we do have ppl out there that have a sweet sole bless you for what you have done. True love. Just being kind. We had one when i was a kid. Followed my grandmother around all the time. What a wonderful story...so cute! 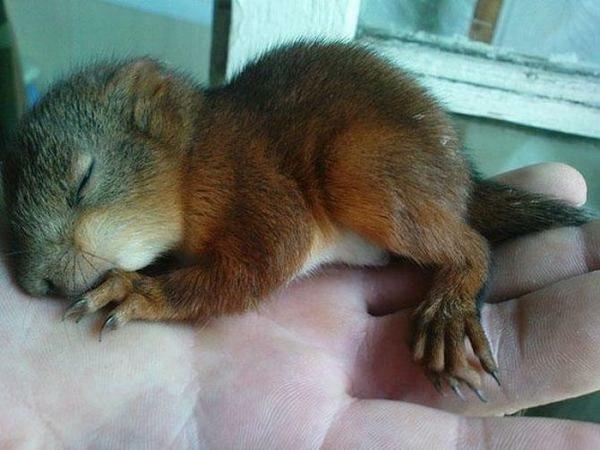 I tried to save a baby red squirrel but it died 4 days later...very nice story! Wonderful story but can he trust that cat? that is love and kindness ..thank you for your story ,nice to see people everywhere on this planet who are caring for all creatures in need ! Aaaaaaaah, I'm dying of cuteness!! That is super adorable! 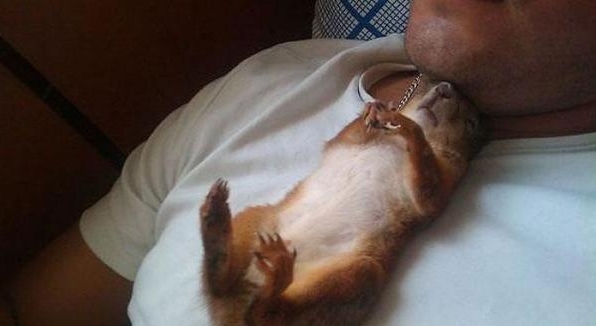 Very sweet of the soldier to nurse the squirrel back to health. You don't usually see that. That is just Awesome you found the one thing that was meant for you to find and that was that sweet little life that you saved. Now that's a REAL MAN....How precious. I wish all men and women where this compassionate and wonderful. 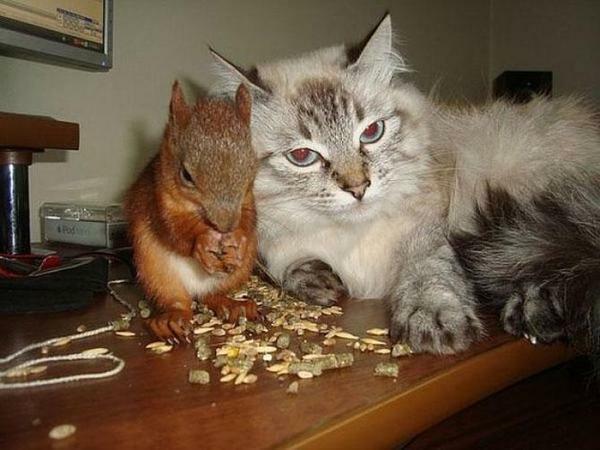 If I were that squirrel, I would never leave his side either !! looks like the cat is planning something. This is a lovely story! And what a lovely man! SO SWEET!!! I LOVE THIS! What a wonderful man! When you give love it comes back 1,000 times over in joy and love returned. I rescued a squirrel as a tiny baby with his/her front teeth broken out from a fall from a nest to the concrete. He/she lived in my house and the teeth grew back. However, as it grew older it always had a choice to go out the window and leave. As time went by it gradually became independent and moved outdoors and started a "squirrel life" with its own kind. you can see the love this man has shining through his eye's. He's a real hero. A real man! Great story...a great guy and a pet full of love. 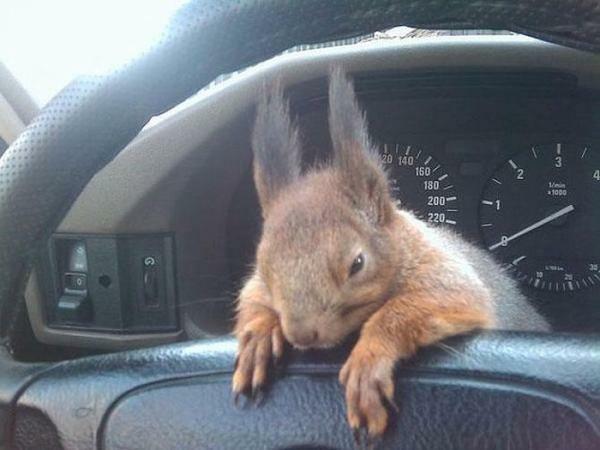 I wish I had a squirrel like that! I feed the squirrels at a park everyday. They only let me get so close to them, but I will protect them the best I can. They mean the world to me. 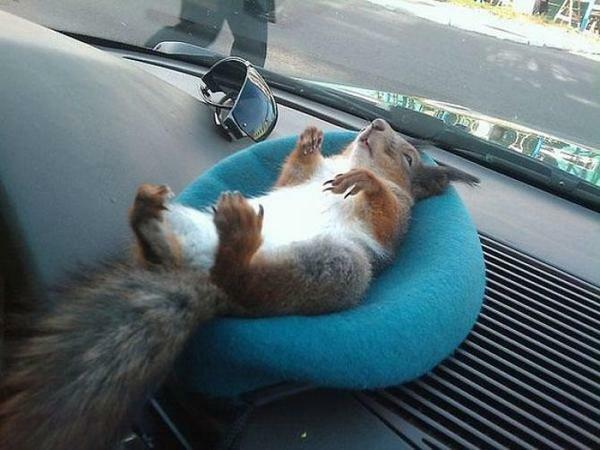 My dream is to have a squirrel sanctuary and they wouldn't have to worry about getting hit by cars. There would be no birds, dogs or people. It would be climate controlled and they could live their happy lives! That is amazing and adorable! Squirrel is cute, moose (daddy) is cute and kitty too. I hope that your friendship and love of each other will last a long long time. Your story is wonderful and I'm glad you have each other. Hugs to you both. God works in Mysterious Ways...................!!! Isn't it wonderful? 2 heroes to this story. 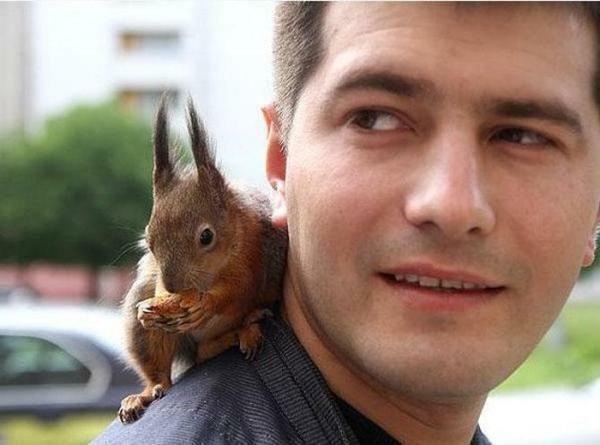 The man AND the squirrel, for giving back so much love to his savior..beautiful indeed..
Now that's husband material! I have two ground squirrels called prairie dogs here in the US since they were babies. They are amazing little companions and personalities! Such a wonderful story. Thank you for saving this little fella. We need more people like this in the world. So happy that I came across this article today. This heart-warming tale brightened my day. Thank you!! Beautiful story. Remarkable man with a nice heart. The world needs people like this man; if most of us showed empathy and love for other living creatures instead of hurting them we would be living in a more peaceful and harmonious world. God bless his soul! OMG!!! That's so cute. 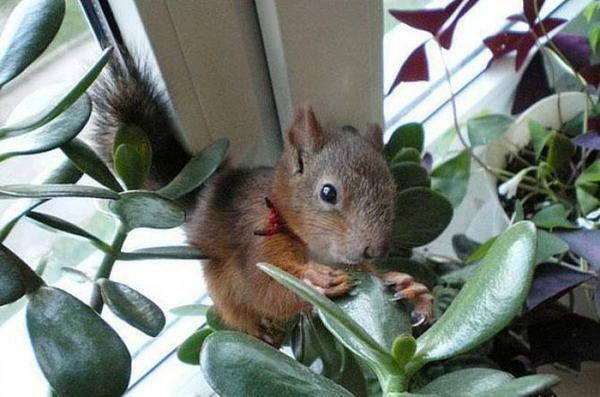 What a great story and a wonderful soul, thanks for take care of this adorable squirrel. Blessings for both. I'm so happy for the squirrell and the man who gains so much enjoyment in allowing a beast to love him unconditionally like this. Yes, we all should be this way with each other and all animals. how awesome is this? Sir, you rock! Thank you for loving the furry kids among us. Love the cat too! Bless you for your kindness! It looks like Minsk and his love and trust of you are your reward. All humans need to learn we are only one of Earth's many creatures. Thank you for saving this baby.... he is beautiful and so are you for showing how real men should be. Fantastic, and this guy is a REAL man, a warrior with compassion. The best. Your kindness has touched many people and set a fine example of compassion for animals. Bless you. Thank you for sharing your happiness, may you have good health and eternal frienship. Bless your hearts. thats awesome we rescued a baby squirrel as well he went back to the wild tho when he was grown but as a baby he loved to sleep in a shirt pocket so everyone in my family wore either button up shirts with pockets or t-shirts with pockets lol!! very sweet loving little creatures !!! So lovely. What a beautiful man. Thank you for sharing this story! Such a loving, caring man you are. Love this connection between the both of you. Thank you for saving this little squirrel. God Bless you. 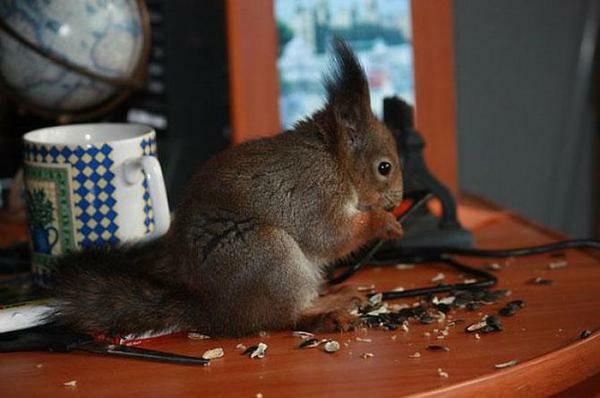 Great Story, Kudos to him for saving that little squirrel. Karma will reward him. wonderful man, kind and caring. they make a great team. man is happy, squirrel is happy too. this is a love affair of the sweetest kind. i hope they have many years together!!! Animals are a gift from our Creator. They make us smile and warm our hearts. I doubt anyone reading this story isn't grinning just reading about the love shown here. The bond between man and wildlife inspirers. Thank you kindly for sharing your story. Now I'll go share it with my Grandbabies and inspire them. Beautiful story - thanks for sharing. I absolutely love this story. Thanks for posting it. this must be the best friendship ever . love and blessings to you both. 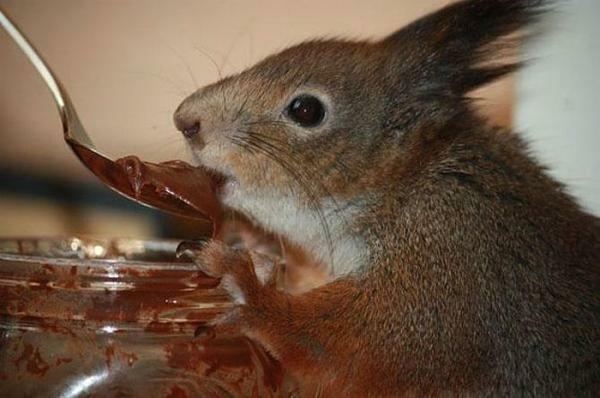 Squirrel is so cute to see that activity.It very awesome. Loved the story----a great guy and an adorable squirrel.